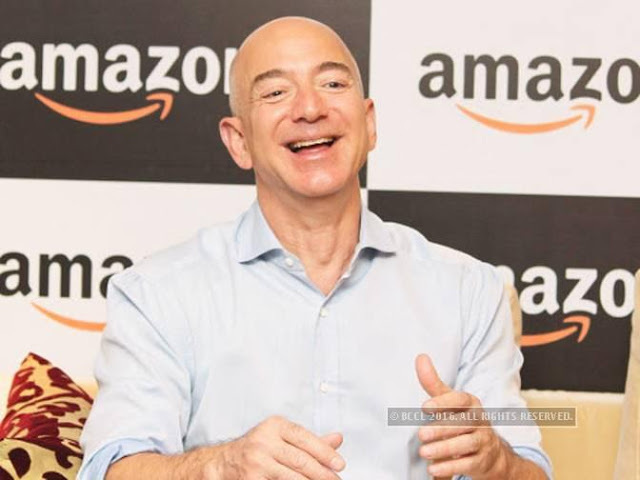 The founder of Amazon.com Inc Jeff Bezos, on Friday added over $2.4billion to his fortune which now stands at $100.3 billion. The world richest man who own the world's biggest online retailer's website is the first billionaire to hit the $100 billion mark since Bill Gate hit it almost 18 years ago. Amazon's shares spiked more than 2 percent based on the company’s prospects for the holiday shopping, with daily online purchases rising 18.4 percent over last year. Due to the unexpected high sales volume that was recorded on Thursday and Friday, Amazon made over $2 billion and its stock jumped by 2.58 percent, taking the company's market value to staggering $571 billion, just behind Microsoft's $642 billion. Amazon announced on its official website and social media handles its best selling items on Black Friday which includes, the Instant Pot Multi- Use Programmable Pressure Cooker and the 23andMe DNA Tester, Echo Dot hands-free, voice-controlled device, the Fire TV Stick — the most powerful streaming media stick under $50 – now with the Alexa Voice Remote, the TP-Link Smart Plug, which works with Amazon Alexa and Google Assistant for voice control.